Madame Claire with supporters at Banban. The Vanuatu Coconut Project (VCP) promised major improvements for the lifestyle of small-scale or ‘grass roots’ coconut farmers in Vanuatu. The funds for this Project were sourced from the European Commission through former Ambassador to Brussels, Roy Mickey Joy. According to an article published by Daily Post on the 7th of October 2014, the release of the first installment towards the Vt2.5billion Santo-based project was to be finalized within weeks of that article. To date, none of those funds have been released. This delay has had escalating impacts on communities, businesses and lives of families that have invested time and resources while patiently waiting for the VCP to be implemented. 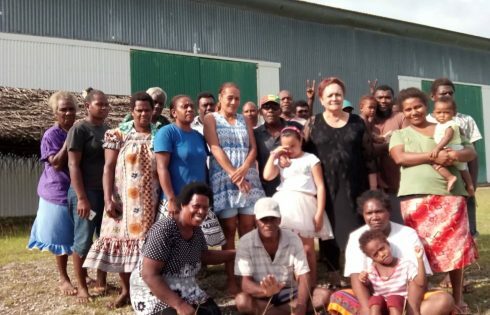 For one of these investors, Madame Claire Lei Tapangaliu Dornic, owner of C.L Agencies, the delay has culminated in an eviction notice served on Monday this week, for her to vacate her property by Friday April 13. Speaking to Daily Post at her property in Banban, Madame Claire shared, “I want, through Daily Post, to stand up for these farmers and families, who have sacrificed long and hard for this project. “First of all, everyone must know that the Vanuatu Coconut Project is a national project, owned by the coconut farmers from Torba to Tafea. I don’t own it. “My role was to provide knowledge, experience, a processing facility and networks for accessing International Markets. “So, if this project is not given a chance to start and grow, all small hold coconut farmers will not receive the value from their crops that they deserve. “This eviction notice is a direct result of the delay in funds. “Believing that the funds would soon be released, i took a loan from Bred Bank to finance the repair of the buildings in preparation for the project. “The delay in the promised funds has made it impossible to have a fully functioning processing plant which would generate income to help repay the loan. “Since 2013, i decided to use my own funds to help these families who have worked hard and made large sacrifices for the Project to be successful. “I’ve paid their food, small allowances in the weekend, cultural obligations for weddings or funerals and school fees because I am a community minded person. “In June of 2016, two weeks before the funds were finalized for release, the government lost confidence in my ability to deliver because of a claim made by the Pacific Advisory Group in Vila, that I was bankrupt. “I am still fighting a defamation case against them,” she alleged. “Bred Bank, which is a business, has decided after many years, not to continue waiting for the promised funds and are selling my property at below the market rate. “Although I have made arrangements with an investor from USA, willing to continue helping our farmers to market their products, Bred Bank have refused to consider our proposal,” she said. The investor alleged the bank has gone to another investor. Flanked with two men of God, Pr John Weimani, a pastor from Christian Revival Centre and Reverend Albert Yakis, as well as the Banban customary Landowner Chief James Turavarc from Tutuba and the support of her loyal staff from the Banban community, Madame Claire believes that she has God, custom and community on her side. Madame Claire is adamant that she will continue to fight until justice is served for the Coconut Farmers she represents throughout Vanuatu. VCP’s vision was to help educate and resource local farmers to generate a higher income through Integrated Coconut Processing – the usage of the whole coconut. In addition, VCP would help the farmers to produce top premium copra for export, resulting in much better income for our ‘grass roots’ Coconut farmers.